DONCKER -Pascaerte van Brazil en NieuNederlandt van Cuorvo en Flores tot de Barbados..
DONCKER,H. - Pascaerte van Brazil en NieuNederlandt van Cuorvo en Flores tot de Barbados..
Pascaerte van Brazil en NieuNederlandt van Cuorvo en Flores tot de Barbados.. - DONCKER,H. Size : 20.6 x 24.1 inches. / 52.3 x 61.3 cm. 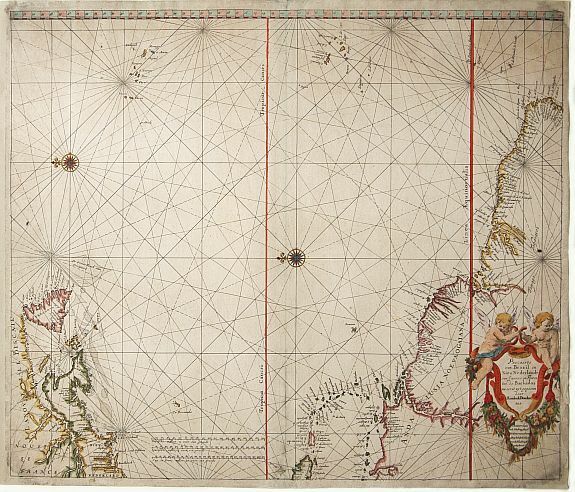 Description :Rare chart of Brazil and the Atlantic Ocean. The plate was originally cut by Arnold Colom, in 1676 Doncker took over the copper plate, the plate was cut the sides and Hendrick Doncker's imprint was added. Philip Burden describes a state (4)but he states that a decorative border is placed around the scales, and a ship is placed in the sea. Our copy however does not have these additions. Burden, America 321, not describing this state. Condition : Paper slightly age-toned. Some marginal repairs, hardly affecting printed area.